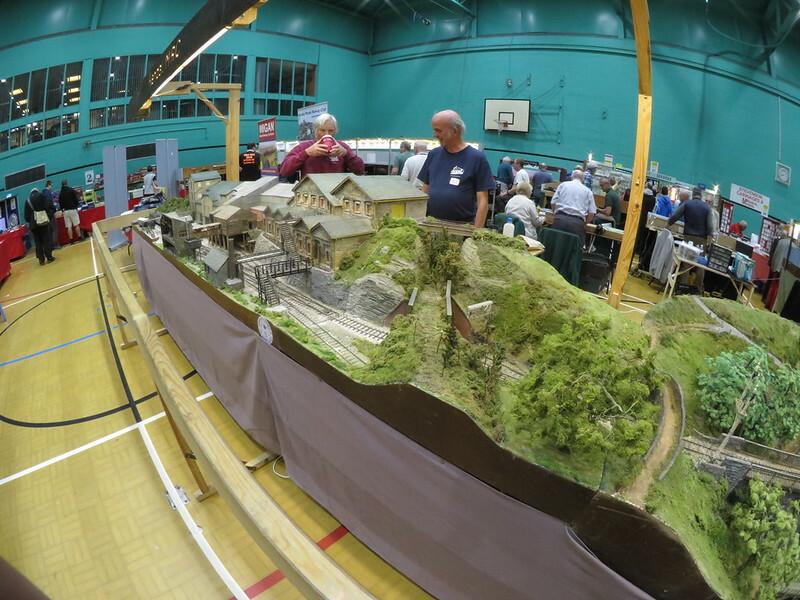 Mostly railways, but a nice selection of plastic models and RC boats and planes too. The Leisure Centre has a swimming pool, so twice a day the RC boat guys are doing demonstrations in there! Had a few good chats and recognised a couple of familiar faces from other model shows. 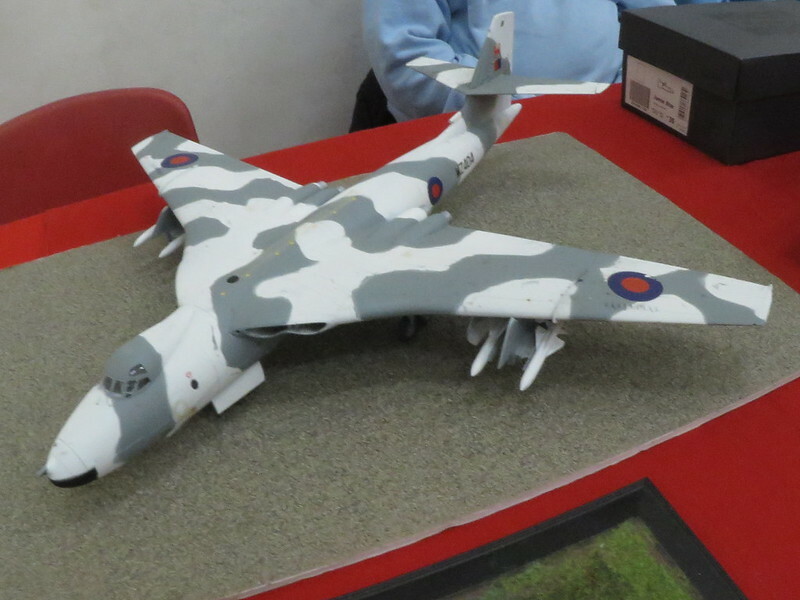 Bought a mint 1/72nd ZTS RWD-5bis (Polish Piper Cubish thing), a couple of Oxford diecast Bedford vans, one in BOAC colours and one Royal Navy, and a few tools. Just took a virtual drive through there, looks like a nice little town. Enough pubs to keep one hydrated! Yeah it's a pretty decent little place. I've been going through it or to it for about 20 years now, since I've worked in two different places actually in Poynton, one in Macclesfield (through Poynton and keep going) and one in Woodford (turn right at Poynton). This show is on again in 2018, but the dates have moved to Sept 15th and 16th. Apparently this gets the organisers more show space and facilities, which is good. I'd be more than happy to guide anyone to any of these places or provide any other help: this is my back yard. Bump, since this is on at the weekend. I originally intended to put a What If display on this year, but a combination of communication screw-ups and my personal priorities means that I had to cancel. I don't know exactly when I'll be going as a punter because, perversely, the better the weather is, the more other things I'll need to do. I'm tentatively thinking of going for a couple of hours on Sunday afternoon, based on the weather reports. Well it rained solidly all day so I spent about three hours at the show. 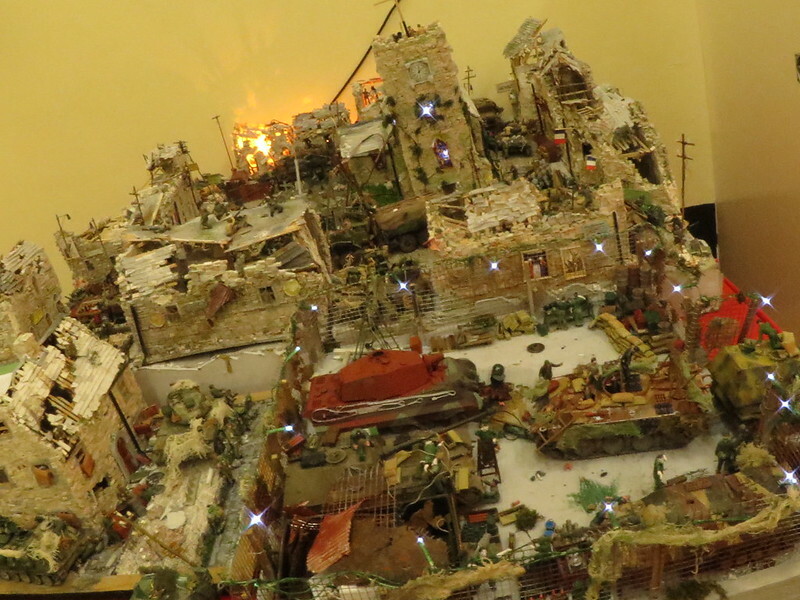 It was good: rather more railway than last year, which meant the plastic model exhibitions were all in a separate room. 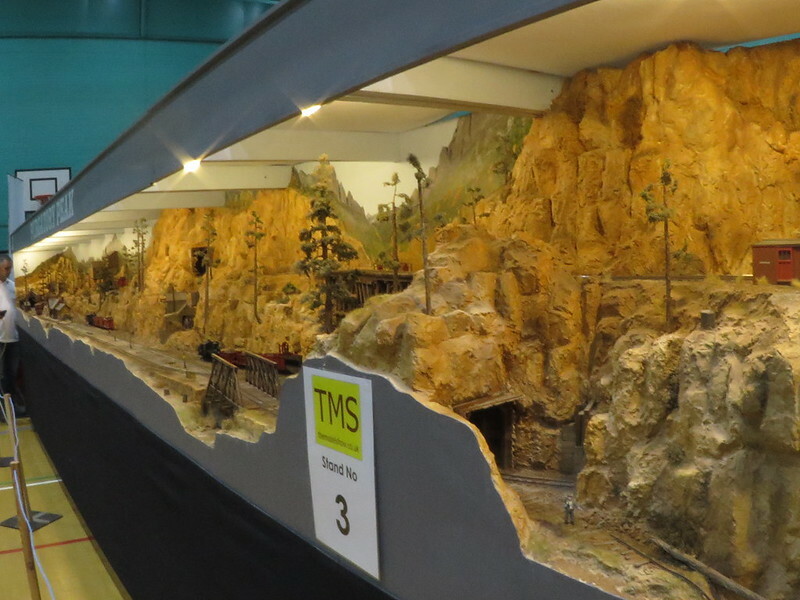 Some of the railway displays were spectacular: an enormous 0-guage layout some 60ft long and a magnificent American mountain railway in particular. 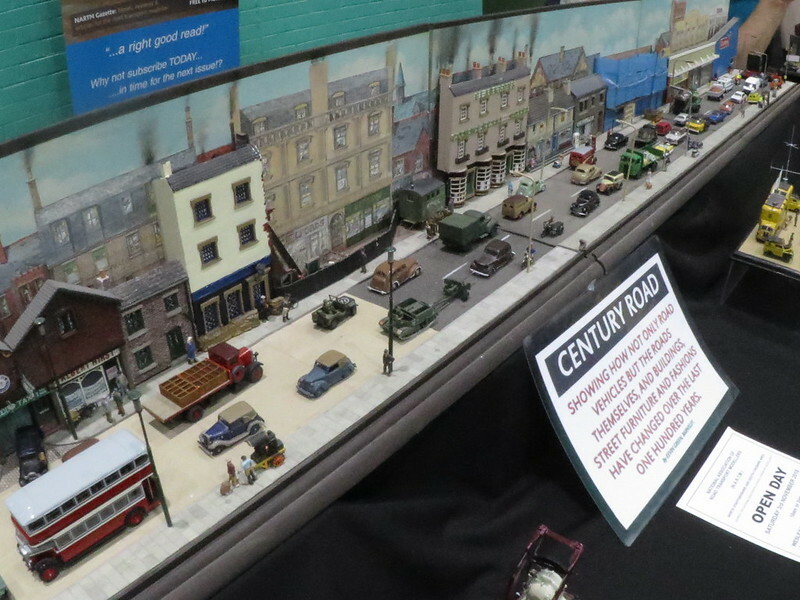 There was also a splendid diorama called Century Road, which had an array of vehicles that changed gradually from 1900 to 2000, complete with changing shop fronts in the background. 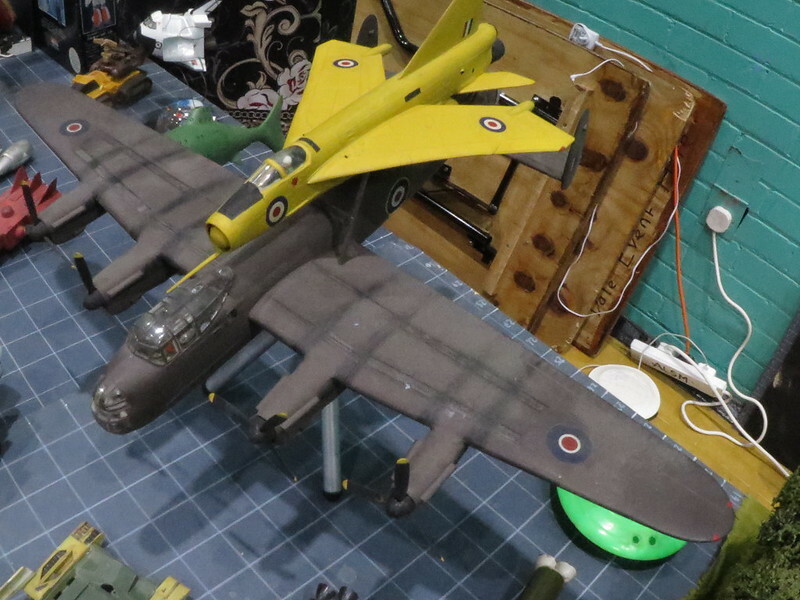 There was also a 1/100th scale Bismark made entirely out of brass, and a 1/144th USN aircraft carrier, complete with some carved wooden planes, that was up for sale. Lot of effort to transport on of those big layouts. Not to mention the set up and take down time. 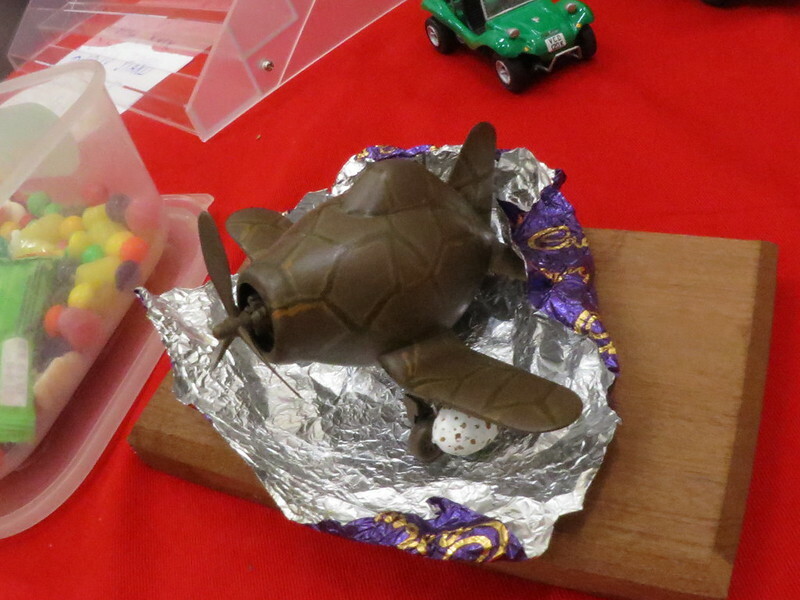 Got any more pics of the green beach buggy at the top of the easter egg plane photo? Sorry, I didn't get a specific pic of the beach buggy.